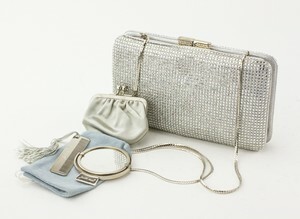 JUDITH LEIBER Swarovski Crystal Sleeping Cat MinaudiÃ¨re Comes with Coin Purse, Compact Mirror, and Travel Comb. Soft gold leather base. Orange gem "spots" throughout.